Dr. Oz has really become a public icon and respected authority in disseminating valuable health information to the masses. While his own specialty is cardiology and he can certainly provide valuable information in this capacity, what makes his show extra special is his access to other doctors and health professionals with cutting edge information. This article looks at Dr.Oz And brain supplements. Below is a short summary of four great episodes focuses on memory and the brain in general. Read through and click on the video links to watch the highlights of each episode. What a great episode! Dr. Amen discussed the findings from one of the largest brain imaging studies ever done. Forty six thousand participants, both male and female, were scanned looking at 80 different parts of the brain. The study showed that “females were significantly more active in 70…” (Dr. Amen, 2013). However, with the increased brain activity women are also more prone to mind related ailments. Dr. Amen identifies these as, “anxiety, depression, insomnia, eating disorders, pain, and being unable to turn off your thoughts” (Dr. Amen, 2013). In his article, Dr. Amen gives 5 ways to unlease the power of the female brain. Click here for a read. Dr. Oz shares how the brain begins to slow down at the age of 30 and questions whether or not this process can be slowed down or even reversed. He shares the findings of a recent study that showed that eating too many calories could cause memory loss. The findings stated that years of over eating could actually age the brain by sixteen years (Dr. Oz, 2012). He went on to share that body shape will also have a lot to do with it. Dr. Oz says, “the most important reason of all to lose weight is dementia” (Dr. Oz, 2012). 1. Trim your thighs with soy isoflavones. 2. Sweeten your coffee with 1 teaspoon raw cane sugar. 3. Protect brain chemicals with sage oil. 4. Add celery to lunch. It’s nothing new that we all begin to worry about memory loss as we age. In this episode, Dr. Oz claims that there are things that we can do to help prevent this. 1. Egg Yolks help keep your brain young. 2. Driving a new route to the grocery store also helps keep your brain young. 3. Vitamin B12, yet again helps keep your brain young. According to a new study it helps protect against Alzheimer’s Disease. 4. Milk is high in choline, just like egg whites and helps keep the brain young. Watch Dr. Oz as he plays this fun game with the audience. 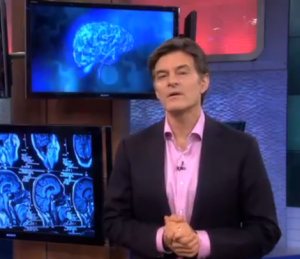 In the Memory Cure episode Dr. Oz discusses all facets of memory, including disease prevention. He shares a miracle plan that can essentially change your life. 1. Take a memory boosting DHA supplement (600 mg per day). 2. Do brain stimulating switch ups (i.e. put your watch on the opposite hand, swap hair brush hand, write backwards, eat with other hand). 3. 7-7-7 stress busting breathing exercise. Breathe in to the count of 7, hold for 7, and breathe out to the count of 7. This exercise calms the nerves and helps reduce levels of cortisol. 4. Tease your memory with basic memory exercises. Try memorizing 20 things on a regular basis. 5. Do brain push-ups to grow brain muscle. Increasing fitness is the best weapon to increasing the brain size. Literally doing push-ups will help to increase muscle as it forces blood flow to the brain. 6. How much you eat and what you eat is crucial. Here are a few great foods to improve your memory: elderberry jam, pecans, chicken giblets, clams, vegetable juice, and beets. Watch the four part video series and learn more.